A forward extra structure provides a secured protected rate, while still allowing beneficial moves up to a pre-determined trigger level. 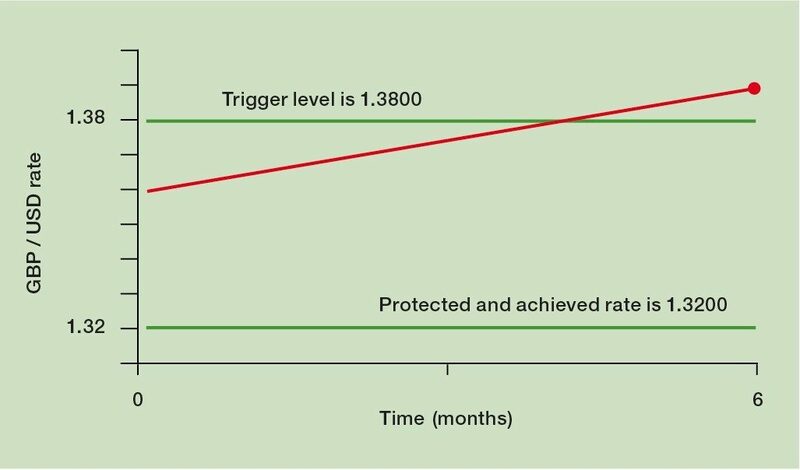 If the trigger level is met or exceeded at any time during the life of the trade, the holder of the forward extra is obliged to deal at the protected rate. If the rate on expiry is in-between the trigger level and protected rate, the holder of the forward extra can transact at the spot rate. If the spot rate at expiry is less favourable than the protected rate the holder of the forward extra can transact at the protected rate. Forward extras are generally structured as zero-cost premium products. The company is prepared to accept a worst-case rate of 1.3200. The company buys a forward extra with a trigger level at 1.3800. The company buying the forward extra does not believe that the GBP/USD rate will exceed 1.3800 during the life of the option. GBP/USD weakens. At maturity of the contract the exchange rate is 1.2800. The company is entitled to buy dollars at 1.3200. GBP/USD strengthens. At maturity, the exchange rate is 1.3600 (but the trigger level of 1.3800 has not been breached during the life of the contract). The company can buy the dollars in the spot market at 1.3600. GBP/USD strengthens, and trades through the trigger level of 1.3800 at any time during the life of the option contract. The company is obliged to buy dollars at 1.3200.